Congenital short QT syndrome has been found to be associated with an increased risk of paroxysmal atrial and ventricular fibrillation and sudden cardiac death. 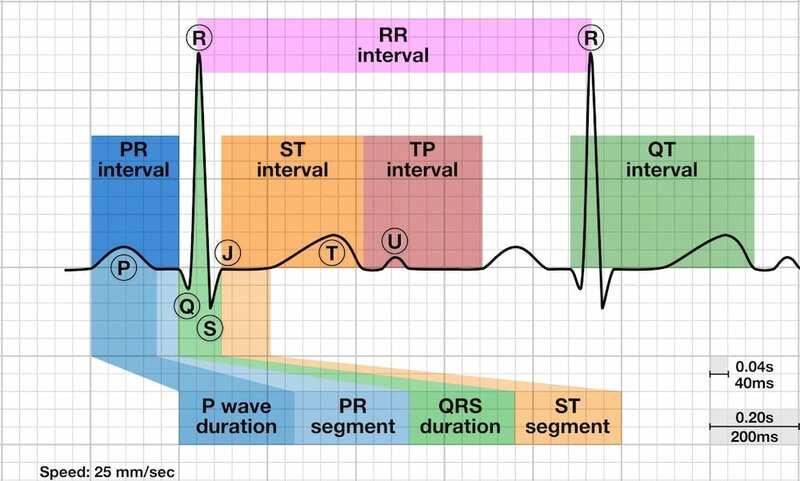 The QT interval is defined from the beginning of the QRS complex to the end of the T wave. The maximum slope intercept method defines the end of the T wave as the intercept between the isoelectric line with the tangent drawn through the maximum down slope of the T wave (left). 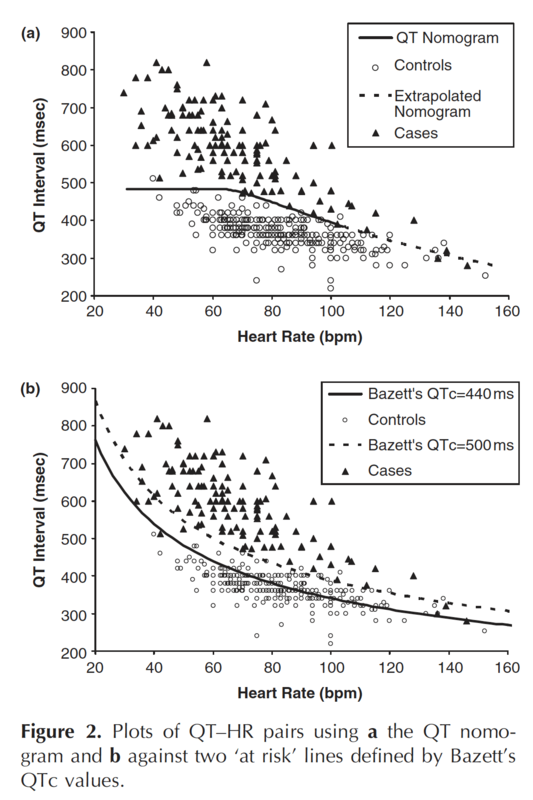 The corrected QT interval (QTc) estimates the QT interval at a standard heart rate of 60 bpm. This allows comparison of QT values over time at different heart rates and improves detection of patients at increased risk of arrhythmias. There are multiple formulas used to estimate QTc (see below). It is not clear which formula is the most useful. Note: The RR interval is given in seconds (RR interval = 60 / heart rate). Bazett and Fridericia are logarithmic corrections whereas Hodges and Framingham are linear correction formulae. Henry Cuthbert Bazett derived his formula in 1920. Bazett formula is the most commonly used due to its simplicity. It over-corrects at heart rates > 100 bpm and under-corrects at heart rates < 60 bpm, but provides an adequate correction for heart rates ranging from 60 – 100 bpm. Louis Sigurd Fridericia derived his formula in 1920 from 50 health individuals aged between 3 and 81 years old. Fredericia formula is the observed QT interval divided by cube root of RR interval, in seconds. Charbit B et al in a study of 108 patients found that automatic QT correction using Bazett formula had a sensitivity for detection of QT prolongation of 54% while automatic QT correction using Fridericia formula had 100% sensitivity. At heart rates outside of the 60 – 100 bpm range, the Fredericia or Framingham corrections are more accurate and should be used instead. If an ECG is fortuitously captured while the patient’s heart rate is 60 bpm, the absolute QT interval should be used instead! Fortunately, there are now multiple i-phone apps that will calculate QTc for you (e.g. 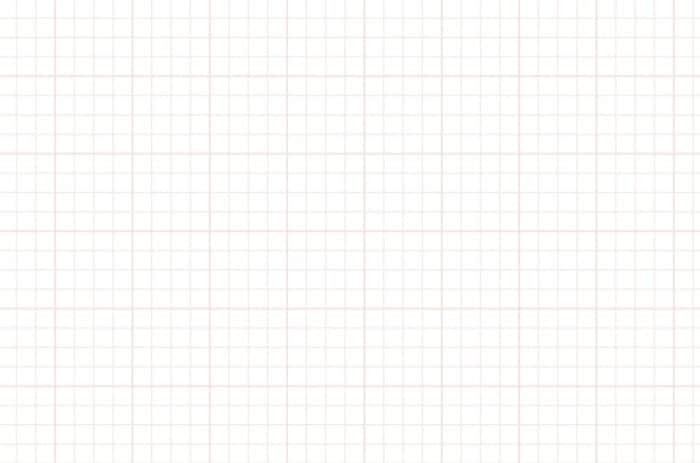 MedCalc), and the website MDCalc.com has a quick and easy QTc calculator that is free to use. Severe hypothermia can cause marked QTc prolongation, often in association with bradyarrhythmias (especially slow AF), Osborn waves and shivering artefact. 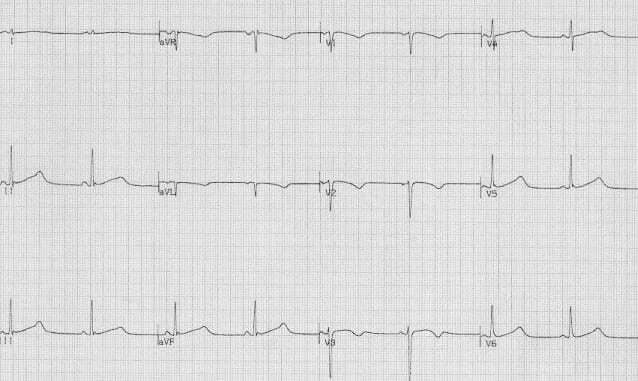 Myocardial ischemia tends to produce a modest increase in the QTc, in the 450-500 ms range. This may be useful in distinguishing hyperacute MI from benign early repolarization (both may produce similar hyperacute T waves, but benign early repolarisation (BER) will usually have a normal QTc). A sudden rise in intracranial pressure (e.g. due to subarachnoid haemorrhage) may produce characteristic T wave changes (‘cerebral T waves’): widespread, deep T wave inversions with a prolonged QTc. 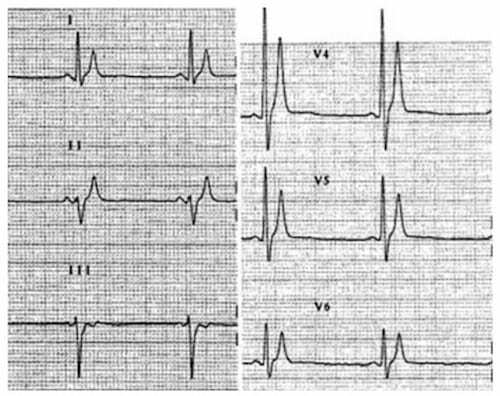 Congenital short QT syndrome (SQTS) is an autosomal dominant inherited disorder of potassium channels associated with an increased risk of paroxysmal atrial and ventricular fibrillation and sudden cardiac death. 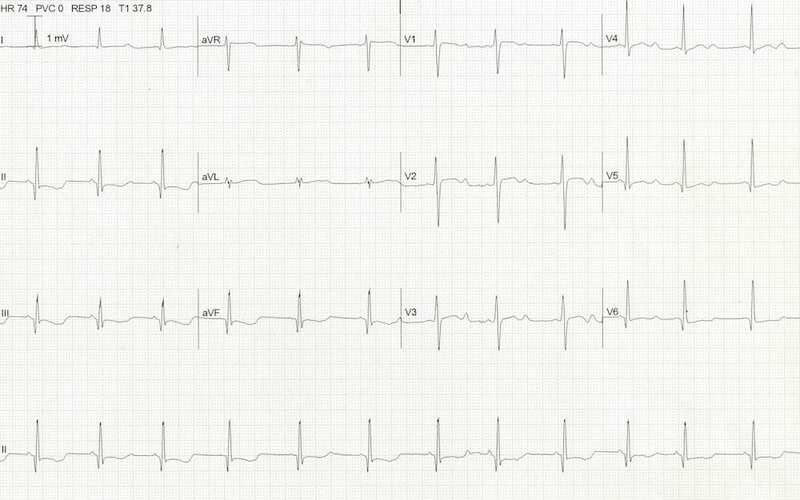 The main ECG changes are very short QTc (<300-350ms) with tall, peaked T waves. 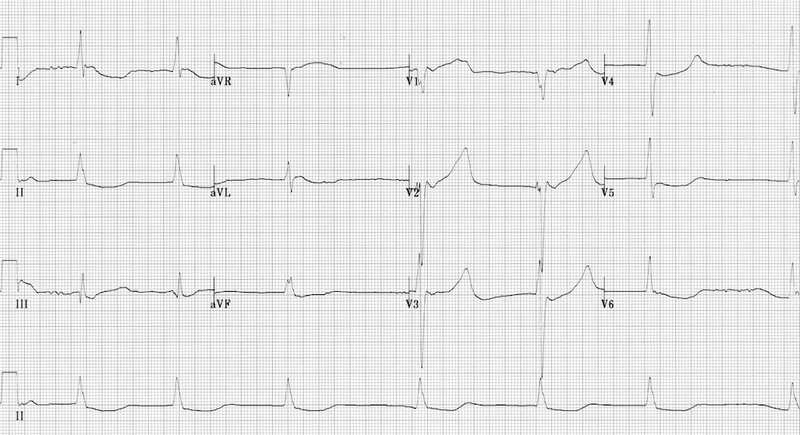 Digoxin produces a relative shortening of the QT interval, along with downward sloping ST segment depression in the lateral leads (‘reverse tick’ appearance), widespread T-wave flattening and inversion, and a multitude of arrhythmias (ventricular ectopy, atrial tachycardia with block, sinus bradycardia, regularized AF, any type of AV block). 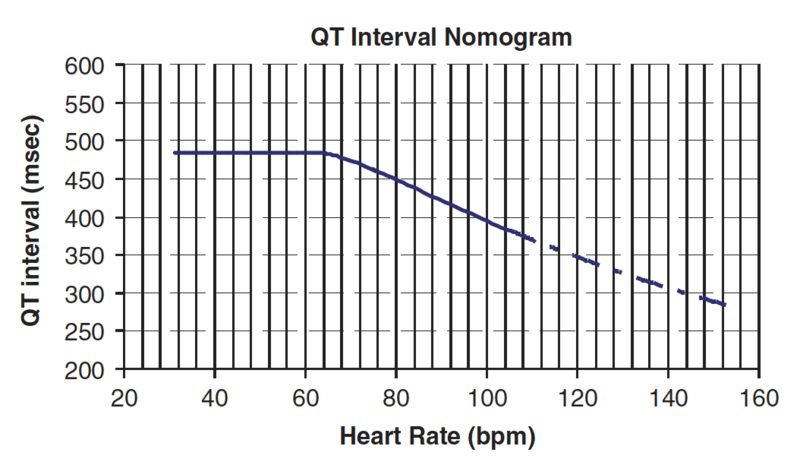 These values are then plotted on the QT nomogram (developed by Chan et al) to determine whether the patient is at risk of TdP. A QT interval-heart rate pair that plots above the line indicates the patient is at risk of TdP. Gaita F, Giustetto C, Bianchi F et al. 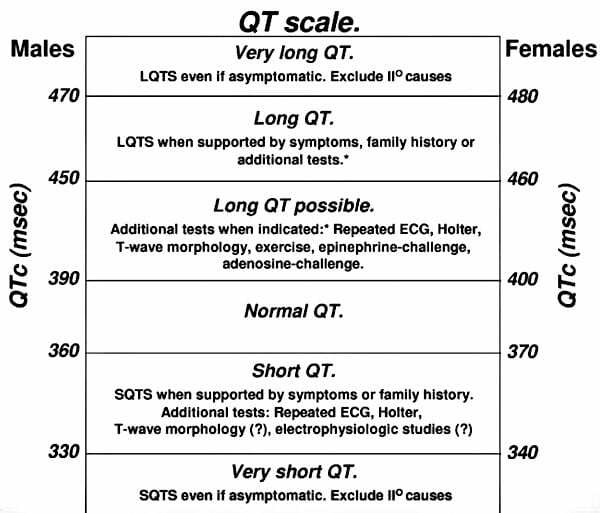 Short QT Syndrome: a familial cause ofsudden death. Circulation. 2003: 108: 965-70.